The market for aggregate materials in North America took a serious hit between 2007 and 2012, as did much of the wider construction industry. Demand fell from 3.8 billion metric tons in 2007 to 3.05 billion metric tons in 2012. While the industry is still playing catch-up from the impact of the Great Recession, there is reason for optimism. Some of the largest markets for aggregate materials are poised to exceed 2007 levels in the next few years. The worldwide construction aggregate market is forecasted to grow by nearly 6 percent per year through 2017 to reach a volume in excess of 53 billion metric tons. The good news does not end there, though. The market is expected to further expand to more than 66 billion metric tons by 2022, says Rock Products, sourcing data from a recent report from The Freedonia Group. Asia will continue to be a significant driver of this market growth, as will Africa and the Mideast regions. More than half of the aggregate market growth between 2012 and 2017 is from crushed stone as a number of countries invest in public infrastructure. China currently accounts for much of the growth in Asian markets, followed by India which is forecasted to continue expanding even as growth in China slows. 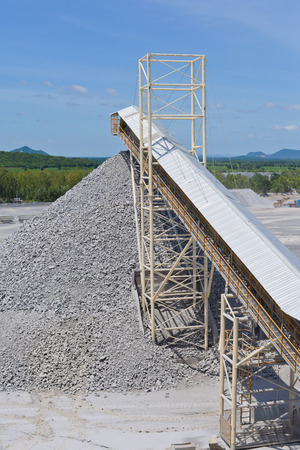 North American markets, which include the United States, Canada and Mexico, are expected to continue growing at more than 4 percent annually for a market that will likely exceed 4.4 billion metric tons of aggregate material by 2022. Worldwide demand for crushed stone is expected to increase by about 7.7 percent annually, while demand for gravel is expected to grow by about 4.7 percent annually through 2017. Demand for sand is expected to be more modest with an increase of about 3.9 percent annually. Aggregate material used for concrete is expected to see an increase in demand of about 5.8 percent annually. Demand for materials used in road base is forecasted to increase about 5.6 percent annually, according to The Freedonia Group’s analysis, while demand for asphalt products in expected to increase by about 3.3 percent annually. With all this growth planned, it may be time to grow your operation and Rackers Equipment can help. As your source for new and used mining and aggregate equipment in the Missouri area, we carry quality quarry equipment at some of the best prices available. Contact us today at 573-635-8700 to learn how we can help with your equipment needs, or browse our inventory of equipment online now.